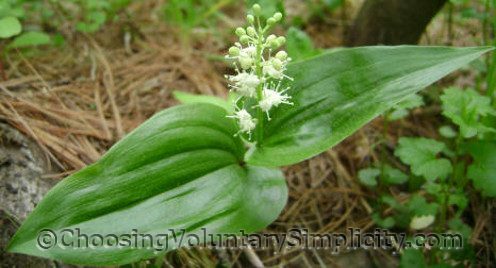 Canadian Mayflowers (Maianthemum canadense) have creeping underground rhizomes and spread quickly. The tiny creamy white flowers grow in feathery clusters at the tip of the stems and are star-shaped with four lobes. New plants usually have only one leaf and do not blossom the first year. Blossoming plants have two or three leaves that are heart-shaped at the base. The spring flowers are followed by spotted greenish-white berries that gradually turn a dull red. 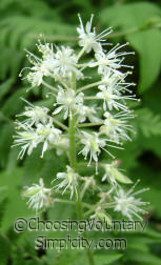 This plant’s height depends on the age of the plant and the growing conditions (they like somewhat moist, sandy loam and partial shade) and can vary from two to eight inches. The Canadian Mayflower is a fairly common wildflower with many names. 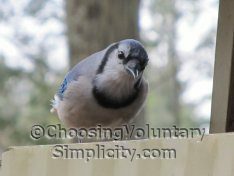 It is often called Wild Lily of the Valley or False Lily of the Valley because of its similar broad, shiny leaves. 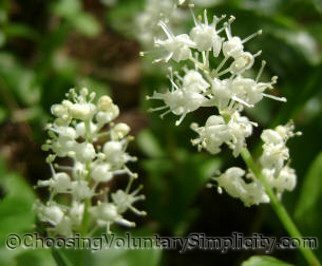 Other names are Canadian May Lily, Canadian Lily of the Valley, and Two Leaved Solomon’s Seal. Several large sections of the wooded area near our meadow are almost “carpeted” with these beautiful little flowers. Thank you for setting me straight because I had always thought these flowers were lilies of the valley because of the leaves. I can see now that I was confused about it. These are still beautiful plants with beautiful flowers, no matter what they’re called. We call these ‘two-leaved solomons seal’. I had not heard of the other names but I like Canadian mayflower better. We have a few growing nearby our farm. They are really pretty little flowers early in the spring.